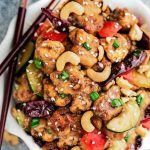 Low Carb Kung Pao Chicken Stir Fry – an easy ONE PAN stir fry for busy weeknights. Best of all, this popular takeout favorite is keto-friendly with the same classic sweet & spicy flavors as your local Chinese restaurant. I’ve adapted my family’s authentic go-to recipe to make it low carb and keto-friendly. The best part about making any takeout dish at home is that you can completely customize the vegetables and spice level to what you like. You can certainly cut back on the red peppers and hot sauce if you don’t like spicy. 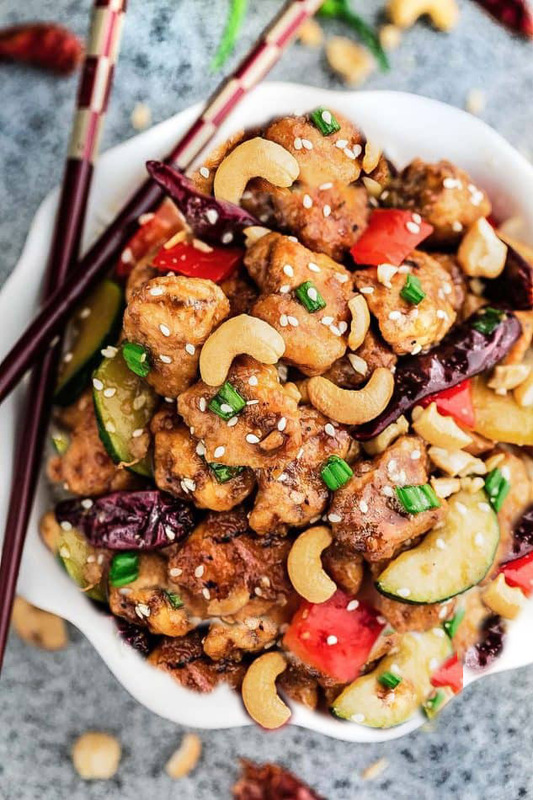 And if you own an Instant Pot Pressure Cooker or a Slow Cooker, you can check out this Slow Cooker Kung Pao Chicken or this Instant Pot Kung Pao Chicken for step-by-step instructions. You’re going to start by whisking together the sauce. It’s made with liquid aminos (or low sodium soy sauce), fish sauce, apple cider vinegar, sesame oil, ginger, garlic and erythritol (or your favorite low carb sweetener). Next, you’re going to season the chicken with Himalayan salt, black pepper and 1 tablespoon of the sauce (reserve the rest for later). Allow to marinate for at least 10 minutes. Heat a wok or skillet on medium-high heat and cook until slightly brown and just cooked through. Add the zucchini, bell peppers and dried red chili peppers into the pan and saute until tender crisp. Add the cashews (or peanuts) an pour in the remaining sauce and allow to cook for 3-5 minutes on high until the sauce has reduced. You can add some xanthan gum to thicken up the sauce even more, if desired. Sprinkle with sesame seeds, scallions and serve over cauliflower rice or spiralized zucchini noodles. WHAT’S THE DIFFERENT BETWEEN KUNG PAO CHICKEN AND GENERAL TSO’S CHICKEN? Both of these North American takeout favorites have a similar trait. They both have some sort of spice level but General Tso’s Chicken is usually deep-fried with a crispy coating while Kung Pao Chicken does not. 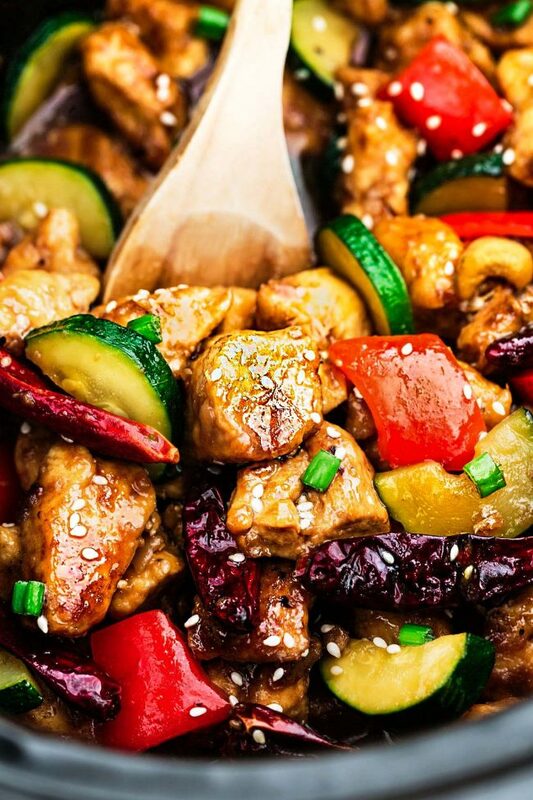 Kung Pao Chicken is also usually stir-fried with vegetables. WHAT VEGETABLES USUALLY GO WELL WITH KUNG PAO CHICKEN? 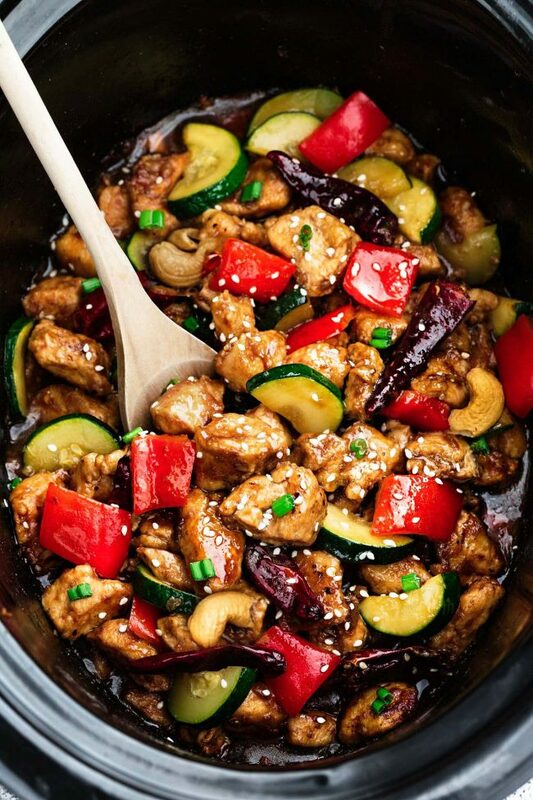 Kung Pao Chicken goes well with a number of vegetables. This recipe is made with zucchini and red bell peppers which are both relatively low carb. You can certainly saute the chicken with broccoli, bok choy or cauliflower if you prefer. Season chicken with salt, pepper and 1 tablespoon of sauce/marinade. Add the chicken and cook for 5-6 minutes, or until the chicken is starting to brown and almost cooked through. Toss in the zucchini, bell peppers and dried chili peppers (if using) and cook for 2-3 minutes, or until the vegetables are crisp-tender and the chicken is cooked through. Pour in the remaining sauce and add the cashews. Toss everything together and turn heat to high. Allow sauce to reduce and thicken. Season with salt, pepper or additional red pepper chili flakes as needed. You can add a little bit of 1/4 teaspoon xantham gum to thicken up the sauce further, if desired. Remove from heat and serve warm on a large platter or over zoodles or cauliflower rice. Sprinkle with sesame seeds and green onions if desired.